Glaze is the raw material which is used to form ceramic products. Manufacturers of ceramic products have to carefully consider critical issues and optimize their production methods if they wish to produce high quality ceramic products. Most ceramic product manufacturers use conventional automation equipment to mix and produce the glaze. This generally involves the use of an AC induction motor coupled to a gearbox to produce the high rotational torque and low speed required to mix the glaze. The ability to maintain torque and speed during the process is critical. If stable and constant speed and torque are not maintained, the resulting variation can create problems with the mix and result in waste and subsequent cost to the users. One of the dangers of using a gearbox in this mixing application is that even the smallest quantity of oil which leaks from the gearbox into the mixing tank will compromise the quality of the glaze mix and waste all the material in the tank. Both AC induction motors and gearboxes are inefficient. The combination of using both together doubles the inefficiency so costing the user with a high level of wasted energy and undesirable generated waste heat. EMF Motor have the perfect solution for this critical application. The EMF high efficiency torque motor generates very high torque at low speed so can be used in this application as a direct drive solution without the need for a gearbox. The motor can be controlled precisely to accurately maintain speed and torque which results in high productivity and excellent glaze quality. 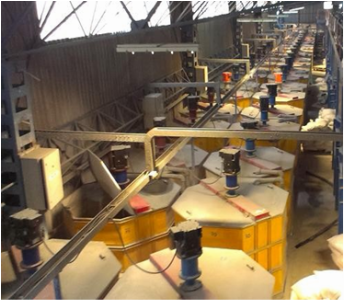 In the ceramic glaze mixing business, EMF Motor has already gained experience with mixers with tank capacities of 500, 1500 and 8000 kg. The patented EMF Motor solution has the capability to mix up to 31 tons of material. In summary the EMF Motor solution continuously produces very high torque at really low speed. The speed and torque is maintained accurately even in open loop configuration. The motor is extremely efficient resulting in minimal power consumption. The EMF Motor requires no gearbox, no maintenance and no additional cooling. EMF Motor works with ceramic product manufacturers to provide the most reliable and efficient production solution and enable the highest level of glaze product quality.